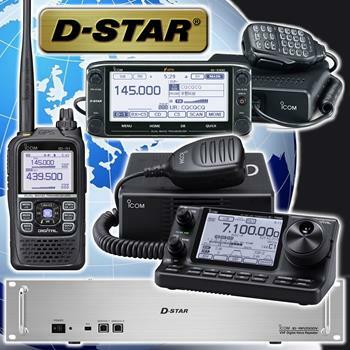 D-STAR, which stands for ‘Digital Smart Technology for Amateur Radio’ is an open digital Amateur radio standard that offers users a number of ways to connect with other users globally via a worldwide network of digital amateur radio repeaters. Just like other forms of Amateur radio, D-STAR has a broad appeal from those Amateurs wanting to communicate just for fun to those who would prefer to push their technical expertise. The D-STAR protocol has rich, exciting opportunities for Amateur radio enthusiasts to experiment and build, utilising 21st century tools such as the web, networking, ethernet, TCP/IP and radio. D-Star is innovative and is keeping radio Amateurs at the forefront of communication technology - Amateur radio has a great future and is moving forward right now with D-STAR digital technology! D-STAR gives users the ability to connect via digital voice as well as slow and high-speed data communications. Slowspeed digital voice and data are transported at 4800 bps, of which 3600 bps is used for voice transmission, the remaining 1200 bps used for synchronisation and general use. Of that 1200 bps, around 900 bps is available for the transmission of data. In order to send and receive greater volumes of data and large files, D-STAR has the "DD Mode" or Digital Data Mode. The DD mode is only supported on the 1.2 GHz amateur band and is capable of sending a receiving data at a 128kbps rate. To send slow-speed data on D-STAR, all which is required is connecting a serial cable from your PC to the data port on the back of the radio. No special or additional data modem is required. To send and receive high-speed data on D-STAR on a 1.2GHz D-STAR radio all that is required is a standard Ethernet cable connection. You can dial up your friend directly simply by putting in his/her callsign into your radio without knowing his or her current location or what D-STAR repeater they are currently using. Repeaters can also be linked together as needed by operators on air to form a wider area conference or system administrators can link repeater gateways together to link all voice & data from multiple repeaters together. Operators can also talk to a repeater via one band and be cross banded out another band on the same repeater. Repeater systems can be interconnected via "reflectors" which are essentially servers on the Internet with appropriate capacity behind broadband Internet links that interconnect many repeaters together. D-STAR is capable of connecting repeater sites using the web to form a world-wide radio network. Voice is converted to a digital format using a bit of computer code referred to as a CODEC. The CODEC code is embedded on a microchip which encodes and decodes the audio signals into and out of the AMBE (Advanced Multi-Band Excitation format). The CODEC that D-STAR uses is the only proprietary portion of DSTAR. All other parts of D-STAR are open which has allowed enthusiasts to develop this part of the hobby. The quality of the D-STAR voice signal is very similar to that of FM voice. There is no degradation in the signal quality that is found with traditional analogue voice modes and no squelch tail at the end of every transmission. Many data communications needs don’t require high-speeds, particularly for emergency communications. D-STAR combines voice and low-speed data into a single channel simultaneously. If you’ve tried to use a repeater channel on 2-meters or 430- 440 MHz in any city, you know how crowded the bands can be. The D-STAR voice and low-speed data signal offers a significant improvement in spectrum efficiency, requiring only a 6 kHz channel instead of the 20, 25, or even 30 kHz of analogue wide-band FM. D-STAR repeaters can be interleaved between existing channels or multiple repeaters deployed in the spectrum of only one analogue FM repeater. How do I get involved with D-STAR? There are a number of ways that you can get involved with D-STAR. The first major requirement is that in order to use the D-STAR system is that you must be a licenced operator. If you aren’t a licenced radio Amateur, the best place to start is with the Radio Society of Great Britain where you will find information about the hobby and how to get into it. 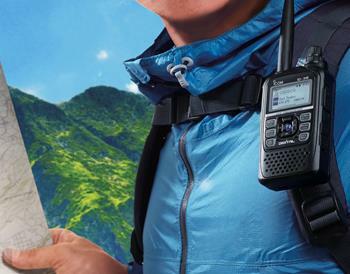 You can use your handheld radio to connect with a local D-STAR enabled repeater and then use it to link to talk to people elsewhere in the world. With a DVAP, you can plug a little dongle into your computer. Then you can user you own D-STAR handheld or base radio to transmit to the computer, which takes your voice and transfers it over the Internet to other repeaters, reflectors and users. This is essentially the same thing as the previous option, but this works if there is no local repeater in your area. Hotspots are very similar to the DVAP although DVAP's low power limits locally e.g. around the house, or maybe down the street if connected to an outside antenna. A Hotspot on the other hand is usually connected to a higher power standard analogue VHF or UHF radio (with a 9600 baud packet port) and therefore has a lot more flexibility and range. With a sufficiently high antenna connected to a radio with a Hotspot interface, you can actually create what some might call a simplex repeater. Like the DVAP, the Hotspot is connected to an Internet enabled PC and the radio via the 9600 baud packet port. The radio is set to a D-STAR simplex frequency and you and your friends can talk all around the world from another hand-held or mobile radio. The absolute first step is to get yourself registered on the D-STAR network. D-STAR Gateways enable users to connect from a local D-STAR repeater, equipped with a D-STAR Gateway, to any other Gateway equipped D-STAR repeater. Once an Amateur is registered with a repeater gateway, it can connect to D-STAR users beyond the local repeaters. You do not have to be registered with a gateway to use a local repeater, only if you want to make use of the D-STAR network. You only have to register with one gateway as your registration information is propagated to all other gateways and reflectors in the D-STAR network. The second step is to make sure you actually have a local repeater that supports D-STAR. If you’re in a city, you probably do, but there are still some gaps in the UK without D-STAR coverage. To find out which D-STAR repeaters are in range and active in your area go to http://www.dstarinfo.com. There are a number of ways you can communicate on the D-STAR network. These include using D-STAR enabled radios that are capable of 3 digital communication streams. The occupied bandwidth of the digital signal is smaller than that needed in analogue transmissions and therefore more digital channels can be provided in a given bandwidth. To enable the repeaters to communicate with each other over the internet the repeater is connected to a PC running a LINUX operating system and Gateway software. This software connects to other gateways and keeps the user lists up to date and connects the digital streams between repeaters. All of the information is distributed within a network that is managed by a ‘Trust Server’. We are currently in the same net as America, Australia and Canada. D-STAR repeaters can be operated in the same way as existing analogue repeaters except that they communicate using a digital transmission from the transmitting radio through to the receiving radio. Unlike other systems that have been developed that use the web for linking distant stations together, D-STAR treats all repeaters in exactly the same way. A local repeater is no different to a repeater 3000 miles away, you just have to route your call to the distant repeater. You can connect to a local repeater and a repeater across the internet and all participants will be treated as though they are on the same repeater. A D-STAR repeater system is typically composed of a repeater controller, 1.2GHz, 70cm or 2mtr digital voice repeater, digital data repeater and the Internet gateway PC. The D-STAR repeater operates similar to an existing analogue repeater. That is a simple relay of transmit and receive communication within or across the 2m, 70cm or 23cm bands. When D-STAR repeaters are connected with the Internet gateway, the D-STAR system relays the received data over the Internet. Your message will get through virtually to anywhere in the D-STAR system. As authorised users make their initial transmission to a D-STAR system, the call sign information attached to the digitised voice packets is recorded by the repeater controller. The controller then shares the information with other D-STAR systems through the D-STAR gateway registry. The registry is maintained on gateway servers located around the world. When an authorised D-STAR user makes a call to a call sign not currently registered on that repeater system, the registry allows the repeater controller to route the call to the repeater on which the targeted user was last registered. A reflector can be considered to be similar to a repeater, but with no RF capabilities. Reflectors are Internet connected servers, generally in data-centres, which receive a transmission from a connected gateway (via the Internet) and send it out to all other connected gateways for retransmission, via RF in the case of a repeater. Reflectors are basically a conference bridge for D-STAR. They allow multiple D-STAR repeaters and Dongle users, from around the world, to be joined together and whatever information is transmitted across one of the repeaters is repeated across all of the connected repeaters. D-STAR provides a whole host of opportunities for the Amateur radio enthusiast to challenge themselves with tools from the 21st. Century. As with all forms of radio, you can dip your toe in the water for just plain old communication or delve further if you are interested in setting up repeaters and send data as projects. It might not be everyone’s cup of tea but this area of the hobby is growing with more and more repeaters and users being added all of the time... good luck in your digital journey! There are many websites to find further information, ideas and support on this fascinating new part of Amateur Radio. For more information about D-STAR products visit the D-STAR section of our website.